Fanpop is a recently launched site that brings together user submitted links, syndicated headlines, forums and social networking. It calls itself a place for fans to share their favorite content regarding any topic. This one scores high on usability and stands a good chance of getting out of the tech niche. Developed by a team from San Francisco, Fanpop is very nicely implemented Ruby on Rails site. Founders Dave Lu and David Papandrew met working at Yahoo! Finance together in 1999 and brought on Michael Chu, founder of Cooking for Engineers, and Cliff Szu to round out the team. The business model is very logical, topic pages get contextual ads and affiliate links to purchase goods in online shopping sites related to the topic. It may not be a big money maker, but it could well prove sustainable with enough traffic. Users who start themed “spots” can put in their own banner graphic, chose an RSS feed to syndicate and add the first topical links to the spot’s list. Links can be rated, commented on, flagged and tagged. User ratings and contributions are tracked as well. Clicking on a tag brings up content with the same tag just in your spot, not on the whole site. Links can be filtered for articles, whole sites, videos and more. When you add another user as a friend you will see everything they have tagged, submitted and rated on your own page. It’s got a great, clean feel to it and it’s fun to use. From MySpace to cigars to vegetarianism, many topics have already begun to be populated enough to see the site in action. 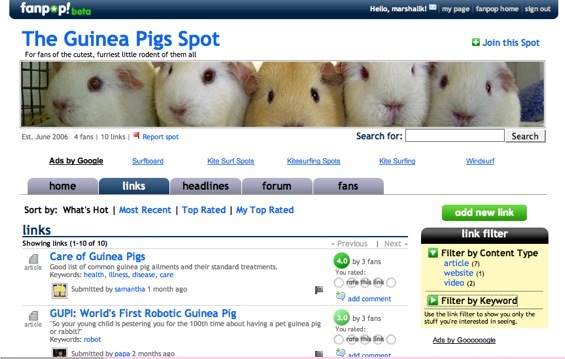 Some one’s even started a TechCrunch Spot – though the Guinea Pig Spot is my favorite so far. The Fanpop team has done a great job with the site’s navigation. User profiles, ratings and different kinds of links aren’t afterthoughts here – they’re really what the site is based on. People familiar with Squidoo may think this is old news, but Fanpop has a really clean look and more customization, social and collaborative features. Technologies like syndication, aggregated content and user ranking are fascinating but struggle to get outside the super geeky world of tech news and shopping. Do people want to use these features to communicate about very specific topics? If everything after launch goes as well as the site’s design has, Fanpop could be an interesting test case.